No. 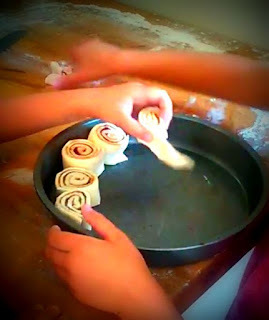 2 and 3 had just finished helping put cinnamon rolls in the pan. No. 3, as I've mentioned before, takes in everything. While placing rolls in the baking pan, she apparently also noticed that her brother No. 2 was mixing the cinnamon sugar. I told them all that we were done helping, and it was time to go play again. No. 3 pointed at the cinnamon sugar mix, and began to scream. There were a dozen different ways I could have defused the moment. I, for example, could have just given her a turn while I supervised, (left unsupervised, she was going to woof all the sugar down). I didn't though. Chalk it up to a bad dad moment, but No. 3's fit continued. She wandered from the kitchen to the living room screaming at the top of her lungs. Wow, WOW! is No. 3 loud! Then, out of nowhere, No. 2 walked up to No. 3, and started singing Itsy Bitsy Spider. No. 3 slowed down her screams, sniffled for a bit, and then? Then, there was silence except for No. 2's small singing voice pleasantly crooning along for no. 3! I grinned from ear to ear! The irony is that up until a few months ago, No. 2 was our premiere fit thrower. He's slowly been winding down his fits, developing coping habits. Now, instead of throwing a fit, he'll usually sigh heavily, walk to his room, and about five minutes later return. Sometimes, he even wants to talk it out! I was bracing for another few years of fits from No. 3, and I still expect we'll have them, but how awesome is it that No. 2, our biggest fit thrower to date is now our biggest helper in making them end?